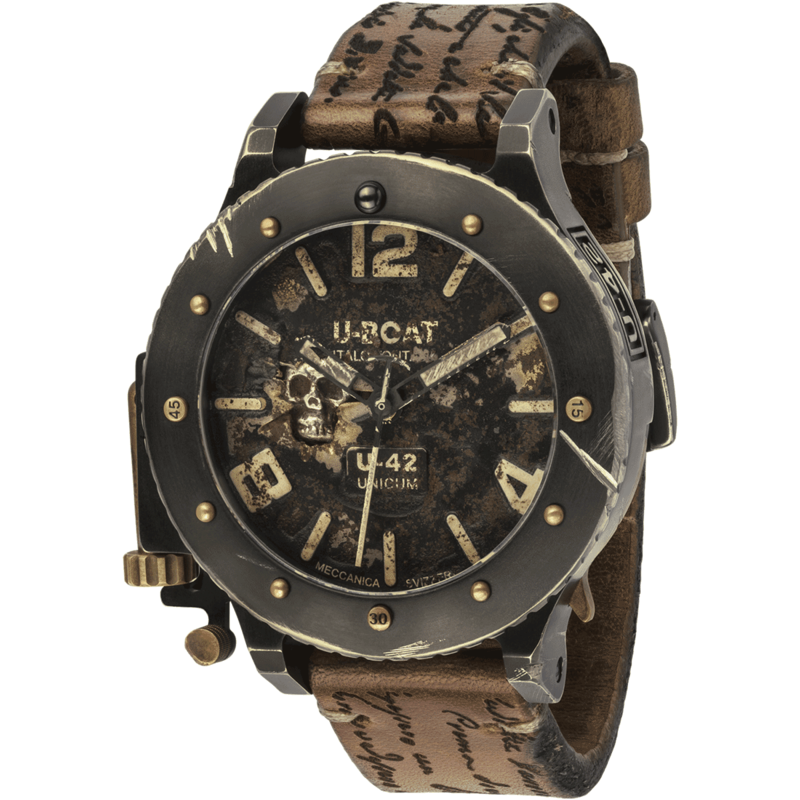 automatic mechanical modified and personalized at U-BOAT specifications with stem position at 9 o’clock. in titanium, with subsequent treatment of IP opaque Black coating. Crown, pin of the hook, indicators on the bezel, bezel release lever in bronze. Bidirectional rotating bezel in titanium lockable with a lever on the right side of the case. 12 o’clock ball indicator on the bezel made of ceramic. 50 mm diameter. Serial number engraved on a small plate fixed on the side of the case. matt black, markers treated with superluminova (peach color). Baton hands, treated with superluminova. Precious decoration in silver at 9 o’clock (skull), hand set. The dial, the case and the hands are refinished by hand using the traditional artisanal techniques. This handmade technique renders each U-BOAT UNICUM, different and one of its kind. handmade calf leather strap with a “tattoo style” pattern made through a laser and processed according to traditional artisan techniques to give the strap a naturally distressed look and feel, brown color. Finishes made with waxed cotton. The incised words are part of an ancient manuscript, a mysterious handwritten letter dated 1572.